Health insurance is a way of pre-paying for the health services used by residents. In health insurance, payments made are spread over the subscribers and over time in the form of some agreed regular contribution. Services are provided according to need. The Provider payment method is therefore “The mechanism used to transfer funds from the purchaser of health care services to the providers.” There are several different methods that can be used to pay providers under a health insurance scheme. These include Fee for service (this is often itemized), Diagnosis Related Groupings (DRG) and Capitation. There is no one perfect method and each method has advantages and disadvantages. Typically therefore most successful health insurance schemes use a combination of methods. Each method has advantages and disadvantages, and a skillful mix of methods, taking into account each unique country context, including economics and history, is the best approach. Effectively and efficiently managed health insurance schemes therefore provide often for a mix of provider payment methods, in a way that allows the advantages and disadvantages of the different methods to balance each other. These methods are explained briefly below. In a fee for service provider payment method, the provider typically lists the different services that they have provided for the client and the cost of each service and requests payment. To use an illustration from day to day life, it is rather like picking up the items you want from a supermarket shelf and then going to the payment counter for the individual cost of each item to be entered into the cash register and added up so that you pay your final bill. The difference between purchasing health care services by fee for service and purchasing items in the supermarket is that because of the specialized knowledge of the health service provider, which the client or patient often does not share, the service provider chooses the “items” for the client. The advantage of the fee for service payment method is that the provider has no incentive to leave anything off the “shopping list”. The disadvantage is that precisely for this reason, since the provider is also often the “owner” of the shop and the one choosing the items to be purchased for the client (because of the issues related to specialized knowledge); it is possible for the provider to provide unnecessary services to maximize profit. It does not mean that the provider will do this, but it is a known weakness of this system. Experience all over the world over time shows that it is a system that can lead to very rapid inflation of costs and threaten the sustainability of health insurance. Countries that use Fee for Service successfully in their health insurance scheme, an example of which is Germany, often devise very complicated methods to counteract this tendency. Despite its well established disadvantage of causing rapid cost inflation which can be a major threat to sustainability - and sometimes leading to unnecessary provision of services because it requires very little technical expertise to implement - fee for service is a common payment mechanism in many low income countries. In the DRG payment method, related diagnoses are grouped together and the average cost of treatment in that group determined. Providers are therefore paid according to the diagnosis they give their client. Many developed countries e.g. USA and U.K, use DRG as part of their payment systems Under the DRG system providers have to fill claims forms for reimbursement after providing the services. The claims made by the providers are then checked (vetted) for accuracy and genuiness before payment. The process is administratively complicated and makes a heavy demand on the time of both provider and scheme staff and the NHIA. The DRG for services also still holds some incentives for cost escalation though they are less than under itemized fee for service. Since medicines at all levels remain under itemized fee for service, the potential of major cost escalation is also strong. Capitation is a provider payment mechanism in which providers in the payment system are paid, typically in advance, a pre-determined fixed rate to provide a defined set of services for each individual enrolled with the provider for a fixed period of time. The amount paid to the provider is irrespective of whether that person would seek care or not during the designated period. The fixed amount is typically expressed on a Per Member Per Month (PMPM) basis. The member refers to NHIS subscribers assigned to the accredited providers. Under this payment system, the member or subscriber selects a preferred primary provider (PPP) to provide all the services under the capitation basket in exchange for the capitation rate. The total capitation amount is transferred to the provider at the beginning of the service period. The amount is calculated based on the total number of members who have selected a given provider. Capitation is a well established provider payment method in several countries – high as well as middle income - and Ghana, in introducing capitation is walking a tried and tested road that many other countries have already successfully walked. The British National Health Service has used capitation for decades. The British system has become more complicated over time with several generations of reform but the basic principle is one of capitation. Thailand which is lauded internationally as a middle income country that now successfully covers virtually all its citizens with health insurance, uses capitation as the base of its provider payment system and reserves methods such as DRG for the higher referral level. Chile and Estonia are other examples of middle income countries successfully using capitation as one of their provider payment methods and have been successful in attaining universal or near universal coverage with health insurance. The provider payment system is the payment method combined with all these supporting systems. 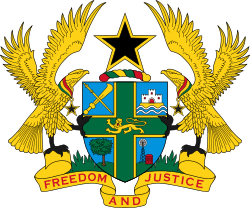 Ghana started off its national health insurance with paying for all services by fee for service. Under this payment method, after the provider had seen the insurance client, they would send a bill listing everything that had been done for the client and how much was being charged for it and request payment. All over the world fee for service is known to have a tendency to cause a rapid rise in costs and is therefore a significant threat to the sustainability of any health insurance scheme if it is applied alone as the payment method without any controls or balances by mixing other methods. Not surprisingly, there was rapid cost inflation in the Ghana NHIS. The lack of standardization of the fees charged was also a source of confusion and controversy. In 2007/2008, the NHIA introduced the Ghana Diagnosis Related Groupings (G-DRG) for services and standard itemized fees for medicines for NHIS clients. Thus the medicines remained under the fee for service system, but their prices were an agreed uniform standard across the country. Diagnosis Related Groupings (DRG) means that payment rates to providers are fixed for a given group of diagnosis. The Ghana-DRG payment method is used at all levels from the primary care right up to the tertiary (teaching) hospitals. The NHIS law that established National Health Insurance in Ghana provided for the institution of multiple payment methods including capitation. LI 1809 specifically mentions capitation as one of the provider payment methods to be considered for use under the NHIS. This is international best practice given there is no perfect provider payment method. The proposed reform in Ghana does not do away with any of the already existing provider payment methods. Rather it introduces capitation for a specific level of care – the primary level of walk in outpatient care, which is the fundamental base of the health care systems, and reserves the DRG for services and Itemized Fee for medicines system to the higher levels of care. Under the proposed capitation system, the amount paid to providers will cater for selected OPD primary care cases. By enforcing the implementation of the gatekeeper system – which is already part of the policy of the Ministry of Health, it will reduce some of the current misuse of care and resultant costs and wastage. For example under the current system a client can visit several providers with the same condition – even on the same day, consuming staff resources and medicines at each point. This is a duplication and waste of scarce staff and financial resources. The major disadvantage of a per capita system is that the provider may be tempted to provide less than needed services to the client. A close monitoring of quality of care is therefore essential in a per capita payment system. It is also necessary to continuously monitor the per capita rate to make sure that it is and remains fair for the package of services covered. An examination of the costs to providers and the NHIS in terms of skill and staff time in claims processing, suggested the need to revisit and work out a way of implementing the capitation payment method which was proposed for use in Ghana at the time the LI 1809 that accompanied Act 650 was drawn but which remained unimplemented. Retaining DRG for Services & Fee for service (FFS) for medicines at Specialist OPD clinics, Hospital referrals and inpatients (district, regional, specialist and teaching hospitals). In Ghana, capitation is being introduced as the payment method for first line basic walk-in care (out-patient). It is important that a base package of services that can be reasonably made accessible to every Ghanaian, whether they live in a complex urban metropolis or a remote rural area, is paid for by the standard capitation rate across the country. Based on a mapping of provider service location and availability, a basic minimum package of services that is reasonable to expect to be made available at every walk-in outpatient department (OPD) has been defined. This defined package will be subject to regular review and modification to fit the experiences and the evolving context of Ghana rather than fixed and for ever unchangeable. Most common Primary Health Care diagnoses. A detailed list of these diagnoses is available. Routine maintenance care for non insulin-dependent diabetes and hypertension (ambulatory care sensitive chronic conditions) on specific simple medications that can be used at the primary care level such as Metformin, Amlodipine and the thiazide diuretics. Treatment at the primary care level will occur after clients have been stabilized by a trained and competent provider (General practice doctor or specialist doctor) and instructions provided to the primary care level on maintenance treatment. Periodic review by a doctor in a specialist OPD clinic and related laboratory tests beyond the basic in the PHC bundle will be covered by DRG. In dealing with averages, the denominator used to calculate the average matters. The per capita rate is an average rate per person who has chosen a particular PPP and has been enrolled. It is a per head rate based on active NHIS subscribers. It is therefore different from the reimbursement per visit which is a per encounter rate based on actual visits to a provider by active NHIS subscribers. The denominator for calculating the two rates are different. To compare the per capita rate directly with what providers earn/charge per client visit is as inappropriate as comparing apples and oranges by the same parameters. Calculation of the per capita rate is based on the total outpatient claims that were paid for outpatient services rendered to NHIS subscribers in Ashanti region. Under capitation the total cost of providing care under the defined basket of services is divided by the total number of subscribers registered with the Preferred Primary Provider (PPP). The comparison of the per capita rate of GHC1.75 for accredited private providers to the cost per OPD encounter or visit is erroneous. The per capita rate has been presented to the general public as if it is the cost per OPD encounter. It is worthy of note that the per capita rate is paid to every provider every month for all NHIS subscribers who have chosen that provider as their PPP whether or not they fall sick. Health care services utilization data for NHIS subscribers as well as utilization data of the Ghana Health Service and other research findings indicate that, on average, subscribers use OPD services twice in a year. The GHC 1.75 per capita amount translates to GHC 21 per annum and this amount will be transferred for all subscribers enrolled with a PPP to cater for only OPD cases that are included in the capitation basket. 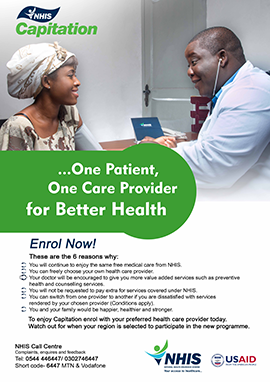 Since providers will be paid in advance on monthly basis for all subscribers enrolled with the provider irrespective of whether or not they fall sick and seek medical care, the capitation amounts are based on enrolment and not encounters or visits. It is also important to note that the per capita amount was calculated based on the current payment for outpatient services and covers outpatient non-specialty cases only. The initial per capita rate calculated was adjusted by 22% to cater for the interim tariff increase announced by the Honorable Minister of Health and implemented in July 2011. The program will be closely monitored and the necessary adjustments made. Providers will still be reimbursed for all OPD specialty cases that are not included in the capitation basket as well as all inpatient cases under the prevailing method of payment, that is, the Ghana Diagnosis Related Groupings (G-DRG). Enrolment refers to the process by which a client is linked to a PPP. Under the Ghana capitation model, clients are being asked to voluntarily choose their PPP. A client can only have one PPP. Clients were asked to make a first, second and third choice not because they could use all 3, but so that if for any reason they could not be tied to their first choice PPP, it would be clear which new PPP to tie them to.